It’s getting warmer some day in these two weeks, but a little bit more time needed for arrival of spring. It had been very warm day as beginning of summer on two days before the STCW training started, but breeze has come back when the actual training started. One of the features of STCW course is advanced firefighting against large fire situation and search and rescue training wearing SCBA (breathing apparatus). Surprisingly, we could find very cute advent of spring in this bleak landscape at NSTC’s firefighting training facility. We planted saplings of cherry blossoms and Japanese plum tree in order to contribute to greenery a few years ago. 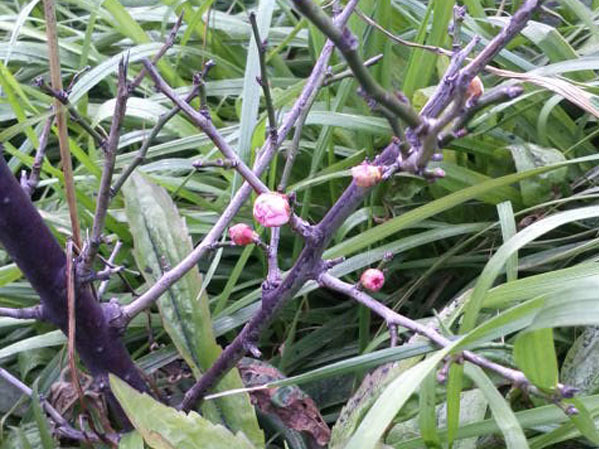 Here we have found small pink-flowered small small young plum tree alongside the training ground for the first time ever!! Now we are looking forward to seeing baby flower of cherry blossom in two month. We truly look forward to have cherry blossom viewing party in some decades!! It is very important to sense and notice a small things like this for safety management, as well. We wish our delegates who have successfully completed STCW training this week to have sensitive eyes to check details so that they will not have to encounter the situation where they need to perform what they have learned during the emergency response training. Thank you very much for joining us! !